Let me give you a very simple example why my investment principles change subject to the environment we are in. Many investors are in love with growth stocks, and it is not difficult to understand why. Growth stocks have outperformed value stocks for many years but, if you do your homework properly, you find a close link between bond yields and the relative performance between growth and value stocks. When bond yields decline, growth stocks outperform value stocks, and vice versa when bond yields rise. With declining bond yields for most of the last 35 years, it is easy to understand why many investors are infatuated with growth stocks. An entire generation of investors have never seen value stocks outperform growth stocks, and those who have hardly remember because it is more than 35 years ago. Now, assuming we stand in front of a multi-year rise in interest rates, even if it is of modest proportions (as I think it will be), all that could be about to change. Investors who are wedded to their growth stock rule may be disappointed, while those who are prepared to adapt to the changing regime are more likely to outperform. 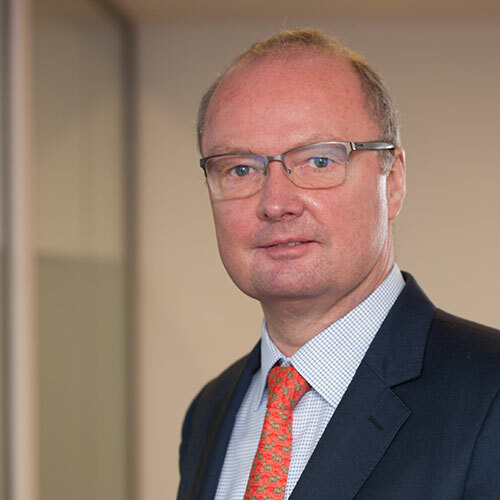 Another example is the wider performance of equity markets. At the very highest level, I divide equity markets into secular bull and secular bear markets. Over the last 150 years or so, the US has enjoyed six secular bull markets and only five secular bear markets (exhibit 1). A secular bull market is characterised by rising earnings multiples, whereas earnings multiples decline in secular bear markets. Falling earnings multiples lead to the sharply lower returns that characterise secular bear markets. 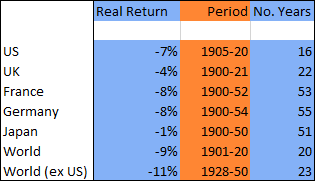 As you can see, the difference in total returns between secular bull and bear markets is quite dramatic. 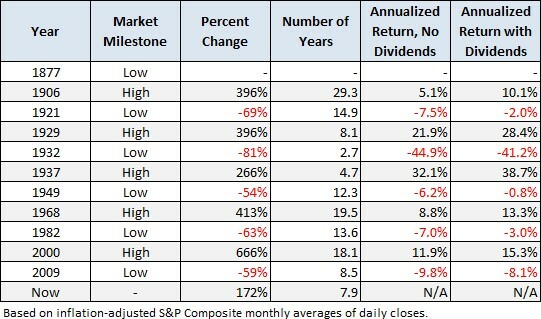 There are no rules as to how long a secular bull or bear market should last for, but history provides some guidelines. Only one has run for more than 20 years, and both bull and bear markets tend to stay in a relatively predictable channel – at least they have done so for the past 150 years (exhibit 2). 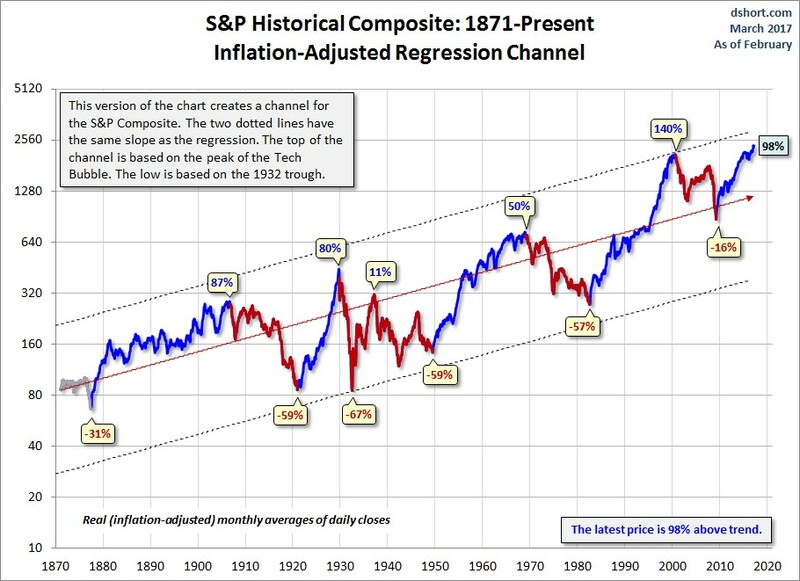 As is also apparent from exhibit 2, the secular bull market we have been in since 2009 is (at the time of writing) 98% above the long-term trend line but, when secular bear markets take charge, equity markets rarely ‘just’ go back to the trend line. Most of them go all the way back to the bottom of the channel. This leads me to conclude that equities in general, and US equities in particular, are priced for problems in the years to come; hence I would allocate only a limited amount to this asset class at present. Having done my very best to dampen your expectations, let’s kill another sacred cow. There appears to be a firmly entrenched view amongst investors - probably driven by the so-called Fed Put (aka the Greenspan Put) - that, whenever the going gets tough, the Fed will bail you out, and it won’t take long before equities are back on track. For that very reason, many investors have chosen to sit out most storms in recent years. If you subscribe to that philosophy, let me remind you that equities sometimes spend decades under water before they finally come back with a vengeance (exhibit 3).